Families arrive Tuesday morning outside LAUSD headquarters to protest the proposed ban on charter schools. Today’s L.A. Unified school board vote on a resolution calling for a moratorium on new charter schools is the latest fallout in the battle against charters that engulfed the district during the six-day teacher strike. But despite scant detail on the resolution’s origin and impact, advocates believe it poses an opportunity for an inclusive community discussion on charters’ value and place in the public school system. The resolution, announced by District 7 board member Richard Vladovic last Wednesday, was a key element in L.A. Unified’s and United Teachers Los Angeles’s agreement one day earlier that ended the strike. If passed, it would direct the superintendent to pursue a moratorium on new charter schools in the district and require the school board to call on state officials to study the financial impact of charters on the district to inform revisions to the state’s charter law. Four of the six board members — the majority of whom were elected with charter organization backing — would have to approve it. How the resolution came about during the negotiations and how it would affect the 110,000 students in the district’s 224 independent charter schools is unclear. Uncertainty and unrest are already being seen through extensive social media campaigns and two rallies scheduled before today’s vote. But education reformers and some board members say this resolution does offer a silver lining: a chance to push for new evaluation measures, replace rhetoric with facts and bring parents’ opinions to the table. The proposed moratorium wouldn’t affect already-established charters, but it’s not explicitly outlined in the resolution what it could mean for new or expanded schools, or how long a moratorium could last. UTLA last Tuesday listed a resolution as the first item in its summary of wins in the new agreement, even though it’s not in the tentative contract. And UTLA posted resolution language that same day, before Vladovic had formally proposed his own. While UTLA’s post looks fairly similar to Vladovic’s resolution, there are some differences: namely, that the union says the resolution is asking for a charter cap — a limit on the number of new schools that could be approved — rather than a moratorium, or temporary pause on any new schools. Neither UTLA nor Vladovic responded to LA School Report’s requests to clarify the discrepancies. Vladovic during the strike called himself a “founding member of UTLA” on Twitter. He’s also regularly approved charters in the past, voting yes on more than 80 percent of last year’s new charter school petitions, according to CCSA data. The Charter Schools Act of 1992 made California the second state to allow educators, community members, parents or other groups to create an alternative type of public school. California, unlike several other states, does not have a cap on charter schools. L.A. Unified has lost more than 245,000 students in the past 15 years — about 35 percent from transfers to charter schools, and the rest to lower birth rates, dropouts and transfers out of the district. Independent charter school enrollment rose steadily between 2013 and 2018, CCSA reported, though traditional school enrollment is declining by at least 12,000 students a year. There were 10 new charters approved by the LA Unified school board last year, a district spokeswoman confirmed. Many charter advocates say they aren’t opposed to taking a fresh look at charter accountability; they welcome it, even, if it’s in the interest of students. But organizations like CCSA are viewing this upcoming resolution as a way to re-up calls for charter policy protections, too. Charters have largely outperformed their peers, even though they get close to $2,000 less in per-pupil funding than district schools. About 48 percent of Los Angeles charter schools yield significantly larger learning gains in reading, while 44 percent do so in math, according to a CREDO study. Charter students also benefit from an average 50 extra days of learning in reading and an additional 79 days of learning in math annually. Those number could be skewed, however, by the fact that charters can draw students who are already high-performing, said Bruce Fuller, an education and public policy professor at UC Berkeley. The resolution also brings the opportunity to talk about evaluating all schools. A trio of three local advocacy organizations have called for expanding the resolution’s accountability and transparency focus to district schools as well as charters. Kids Coalition, Parent Revolution and Speak UP plan to present a resolution amendment during today’s meeting calling for a “consistent” public charter school renewal policy that emphasizes “student improvement and student outcomes,” “parent-friendly district school transparency policies” and new district policies that reward high-performing public charter and district schools. The district has not shown “vigor” in addressing inequities in district schools, making a charter-only target inappropriate, the groups wrote in an op-ed, pointing out that only 38 percent of L.A. Unified graduates are deemed college or career ready on the state’s accountability measurement tool. Parent Revolution in a tweet also spotlighted low achievement in Vladovic’s district, where it said 52 percent of the elementary schools are rated in the lowest two categories — red or orange — in English language arts performance on the California School Dashboard. Cool, cool, cool. Here’s the performance of students in district schools in your school board district from last year. https://t.co/v3PmDT0JGC … Will there be reflection and analysis of the impact of the district on the children that attend this schools? 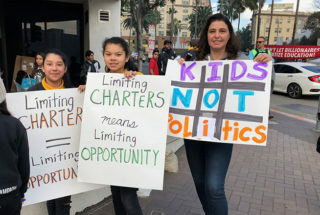 While charter school advocates and district leadership are eager to talk about the future of charters in L.A. Unified, the subject has been mired by politics and divisive rhetoric — especially during the strike. One flashpoint is the public vs. private debate. The union has labeled charters as “privatization” schemes, purporting that they siphon away money from district public schools and into corporations. Charters are often philanthropically supported by wealthy foundations, such as The Eli and Edythe Broad Foundation and the Walton Family Foundation. “This is fundamentally about the teachers union seeing charter schools as an existential threat to their power,” Kids Coalition’s Austin said. Advocates say that mentality neglects the fact that L.A. Unified’s charters — although they are privately run and have more discretion around decisions involving curriculum, the length of the school day and year and hiring and firing — are public schools and non-profit. They “are open to all children, do not require entrance exams … may not discriminate, may not charge tuition [and] must achieve a racial and ethnic balance reflective of the District population,” according to the district website. They are typically not unionized. Another area to clear up, advocates say, is how charters are largely blamed for the district’s declining enrollment and funding losses, as state funding follows students to their public schools. Last year, only 13 percent of district enrollment loss was from families choosing charters, according to a Reason Foundation study. The decline is attributable as well to lower birth rates, dropouts and transfers out of the district, driven in part by the rising cost of renting in Los Angeles. Experts say the district’s low achievement metrics are also a detraction. It must be recognized that there is no one cause for the decline in the District’s enrollment, but rather it is the culmination of various factors, some within and some outside, of the District’s control. Another argument is that charters are not being properly regulated or held accountable. “It’s been a hazy line because there’s technically public accountability, but L.A. Unified has never done a good job assessing the effectiveness of charter schools,” Fuller said, referencing findings from a study he co-authored. “The district has never been assertive in pursuing the question of ‘Are charters more effective than [traditional] public schools?’ I think that’s why people like Alex [Caputo-Pearl] say, ‘These are like private schools.’” The school board approved 54 of the 59 independent charter renewal applications in 2017-18, according to the district. A CCSA spokeswoman said in response that L.A. Unified is considered “a model authorizer in terms of holding schools accountable” with new charter petitions and charter renewal applications, which are required every five years. There are about 50 staff members in the district’s charter school division that divvy up caseloads. By the time a petition goes to the school board for a vote — which follows about two months of overview by the charter division staff and “extensive back and forth” like line-item, red-line edits and capacity hearings — “you can be confident that the [petitioned] school is high capacity, and that they’re going to be able to open the school in the next few years and do a decent job serving kids,” the spokeswoman said. She added that once charters are approved, they have many of the same obligations as traditional schools, such as submitting budgets to the county and commissioning third-party financial audits. District staff visit each charter school at least once annually. Ten of the 19 new charter petitions to the district made it to board approval in 2017-18, the district confirmed. Five were denied; four were withdrawn. Advocates and education watchers agreed that this resolution poses an opportunity for parent insight that wasn’t available during the negotiations between UTLA and L.A. Unified. Thousands of charter school students, families and community members will rally at L.A. Unified headquarters today to oppose a charter ban, followed by a pro-moratorium, union-backed rally. Parents will also be addressing the board during the discussion on the resolution. The board meets at 1 p.m. at district’s Beaudry Avenue headquarters. It will be livestreamed here. A group of parents last week held their own news conference outside City Hall, saying their voices need to be heard when significant decisions are made about their children’s education, and asking for inclusion in local decision-making at their schools. “We don’t want just to be spectators. We want to be part of the action,” said Evelyn Alemán, who has a child at Grover Cleveland Charter High School and is a member of the LAUSD Parent Advisory Committee. “Charter schools should have the same opportunity [as] traditional schools to serve students,” she said in Spanish. These concerns and uncertainties emphasize the importance of getting — and keeping — the conversation going, Castrejón said. Disclosure: The 74, the parent organization of LA School Report, receives funding from The Eli and Edythe Broad Foundation and the Walton Family Foundation.